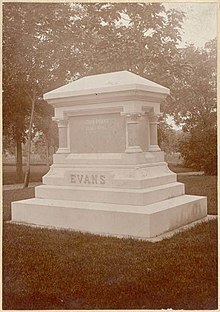 John Evans (March 9, 1814 – July 2, 1897) was an American politician, physician, founder of various hospitals and medical associations, railroad promoter, Governor of the Territory of Colorado, and namesake of Evanston, Illinois, Evanston, Wyoming, Evans, Colorado, and Mount Evans, Colorado. Evans was born in Waynesville, Ohio to David Evans and Rachel Burnett. After starting his studies in medicine in Philadelphia at Clermont Academy, he graduated with a degree in medicine from Cincinnati College in 1838. He then moved to Attica, Indiana, where he practiced medicine and helped found the Indiana Central State Hospital in Indianapolis. He was appointed its first superintendent. He married, first (1838), Hannah Canby (1813–1850) and, second (1853), Margaret P. Gray (1830–1906). Hannah Canby Evans and three of their sons are buried in the old cemetery in Attica. He later moved to Chicago, where he helped found Lakeside Hospital, later named Mercy Hospital, and was responsible for bringing the Sisters of Mercy to staff the new Mercy Hospital. He also founded the Illinois Medical Society, and taught at Rush Medical College. His wealth garnered him a fair amount of political power. He founded the Illinois Republican Party and became a personal friend of Abraham Lincoln. He sold much of his Chicago holdings prior to a trip to England. While away, the property he sold was lost in the Great Chicago Fire. In 1851 he was one of the group of Methodists who founded Northwestern University, and was elected the first president of its Board of Trustees. As governor of the Colorado Territory, John Evans was implicated in creating the conditions for the massacre to occur. In August 1864 Evans had issued a proclamation authorizing "all citizens of Colorado . . . to go in pursuit of all hostile Indians [and] kill and destroy all enemies of the country." Because of the lack of the ability to defend Denver because of the men fighting in the civil war, Evans ordered that so-called "friendly" "Indians" should present themselves to various forts for their "safety and protection," and those who did not were "hostile" and should be "pursued and destroyed." Two U.S. Congressional committees and one military committee were formed to investigate the massacre. Eventually, in 1865, guilt on the part of the U.S. Government was admitted.